William Hill are a colossus in the gambling world. You actually don’t see their marketing as much as that of other bookmakers… but that’s because they don’t need to put as much effort into it. Everyone already knows who they are. Very few bookies are big enough to say that. Just because you’re a popular brand, of course, doesn’t mean you’re a high quality one. And if you’re looking for a new bookie, you shouldn’t automatically go for one of the most famous names. 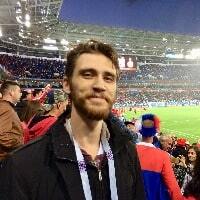 The online betting industry moves extremely quickly. Sometimes, older bookies have trouble keeping up. Have William Hill been able to keep their edge? It’s time to find out, in our comprehensive William Hill football review. New online customers only, place a £10 bet min, win only, min odds 1/2, free bets paid as 3 X £10, 30 days expiry, free bet/ payment method/player/country restriction applies. T&Cs apply. Everything You Can Ask from a Bookie. Excellent Bet £10, Get £30 Welcome Offer. This is one of the areas in which established bookmakers often disappoint. Newer bookies need to draw people in with eye-catching offers. Better-known names don’t have to work so hard. Fortunately, William Hill don’t fall into this trap. The William Hill new customer offer is simply fantastic. In short, if you place a single £10 bet, you get £30 back in the form of three £10 free bets. Qualifying bet must be made at odds of 1/2 or better. 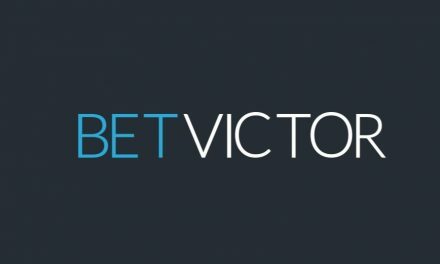 Free bets must be used within 30 days. PayPal deposits are excluded from the offer. Free bet stakes won’t be returned on winning bets. Getting £30 in William Hill free bets is generous enough already. The qualifying bet only requiring odds of 1/2 is the icing on a particularly tasty cake. Place a smart qualifying wager, and there’s every chance of effectively turning your initial £10 into £45 (£10 stake, £5 winnings, £30 in free bets) with a single, safe bet. Simply put, welcome offers don’t get much better than this. Again, this is an area in which established bookmakers often fall down. Once more, William Hill buck the trend in this regard. There are around 10 William Hill promotions at the time of writing (depending on what you actually class as a promotion). These are certainly focused on football and horse racing – the two biggest betting markets – but tennis, greyhound racing and other sports are also covered. 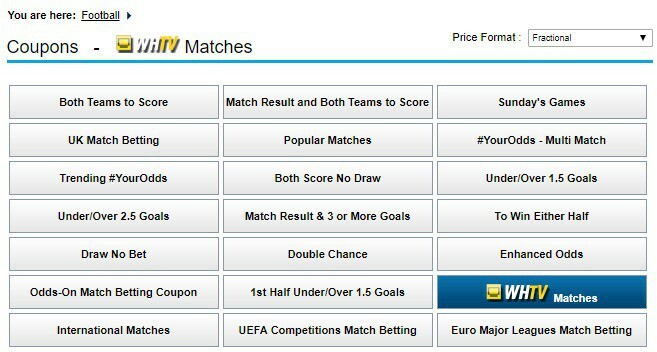 Perhaps the most eye-catching offer of all is the Bet Boost for football. Stick three or more selections in your accumulator, and – once per day – you’ll be allowed to significantly boost the odds you get. Similar deals are also available for horse racing bettors. Unusually, tennis fans are also well catered-for here, courtesy of the In-Play Tennis Insurance William Hill offer. Every week, you can get 10% of your net losses back in the form of a free bet, up to a generous £25. Finally, William Hill do a great job of keeping things fresh via their Flash Odds. New special offers pop up constantly for specific events across a whole range of sports, usually at highly enticing odds. Football is comfortably the most popular sport in the UK, so it’s no surprise it dominates the betting landscape too. 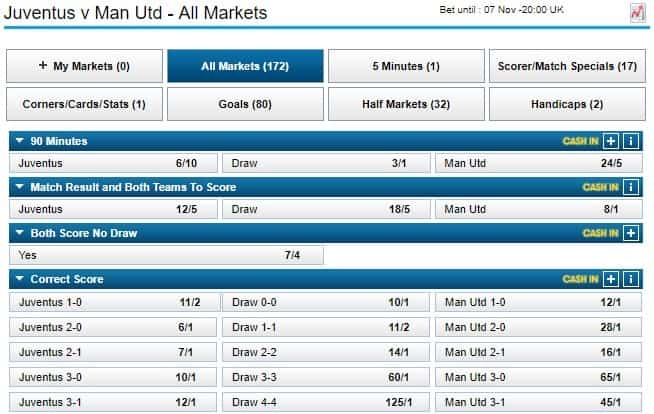 Many punters will sign up for a bookie based purely on the quality of its football betting features. In this regard, William Hill absolutely nails it. It all begins with the layout, which is absolutely fantastic. Live matches are displayed at the top, ready and waiting for you to place your in-play bets immediately. Below that, there’s a “Football Highlights” section. This basically collects all the biggest upcoming games you’re likely to bet on, from all around the world, intelligently sorted into a rough order of importance for the UK audience. Further down, you’ve got longer-term outright bets, like Premier League Top Goalscorer, who’s going to get relegated, and so on. The odds for most markets are extremely competitive, tending to at least be in line with those of the competition. Pleasingly, they often get even better courtesy of the Enhanced Odds feature. 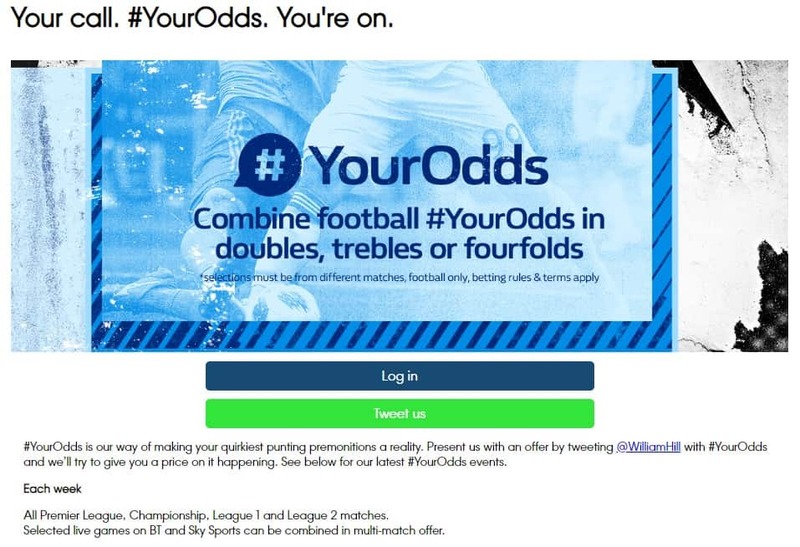 This handy little promotion boosts the odds on certain markets, which range from simple Both Teams to Score bets, to BTTS, a certain player to score, and a team to win. Whatever the specifics, the odds always get an enticing lift upwards. The aforementioned in-play betting works flawlessly. Odds are constantly updated as the match goes on. The vast majority of betting options stay open throughout the game, unlike some bookies who sneakily “suspend” certain markets. The actual bet-placing works quickly and smoothly, and it’s exactly the same story with the William Hill cash out feature. Finally, special mention must be made of William Hill’s streaming service, William Hill TV. It’s completely free for all users who have a positive account balance, and allows you to watch live football on your desktop, tablet or mobile device. Dozens of matches are available each week, from Europe, North America, and elsewhere across the globe. William Hill doesn’t let its focus on football distract from the millions of fans of other sports out there. All the major sports for betting are represented thoroughly, including horse racing, tennis, golf, cricket and rugby. This doesn’t just apply to the number of markets, but to the extra features too. William Hill TV allows fans to stream live events from a variety of sports – not just football – with horse racing being particularly well-covered. There’s also a solid range of special offers, both ongoing and event-specific, available at all times for other sports. In this day and age, one of a bookie’s biggest priorities should be the quality of its mobile app. On-the-go betting has exploded in the past decade or so, and it’s getting more popular all the time. The William Hill app is easily one of the best on the market. The interface is similarly excellent to the desktop version’s, except for the addition of a helpful menu along the bottom, which helps you to speedily navigate between all the most important sections. As we mentioned earlier, you can also stream live sports through the mobile app, which is obviously fantastic. In our experience, everything worked flawlessly and extremely quickly. The app didn’t seem to drain our battery life significantly either. Finally… you don’t have to just take our word for any of this! The iOS version has an excellent 4.5* average rating, based on 8.7k reviews. For reference, this is currently superior to the ratings of bet365, Coral and Ladbrokes. The William Hill Android app fares well too, with a solid 4* rating on Google Play, from over 5,500 reviews. If you’d prefer not to download the app for some reason, the William Hill mobile version is also an option. The layout is a little more awkward here, and we much preferred the actual app, but it’s definitely usable. Security is normally a pretty big concern when signing up with a bookie. That’s not the case for any William Hill football bettors, the bookmaker has been around forever, after all. Aside from SSL encryption being in place, William don’t offer a huge amount of information about their security measures. Still, they are fully licensed and regulated by the UK Gambling Commission, which should put users’ minds at ease. They also enjoy a reputation for generally being a safe and reliable bookie. We’d love to get a more detailed explanation of William Hill’s security on their website. Regardless, thanks to their excellent track record and prestigious license, we’re willing to give them a pass here. The William Hill signup process is short and sweet, with everything clearly explained. At the first stage, you simply need to enter a few personal details – your name, email address, physical address, and so on. At the second stage, you set up the protection on your account, including a password and a security question. 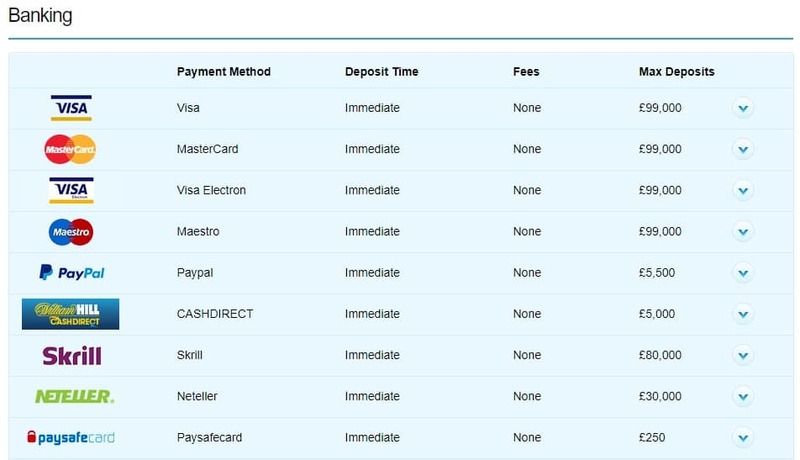 You can also set yourself a daily, weekly or monthly deposit limit. After you’ve completed those two steps, your account will be created and you can start funding it. You will still need to have your identity verified, however, to prove that you’re over 18. You can send in a passport, driving license, National ID Card or birth certificate for this purpose, and you must do so within 72 hours of your first deposit. Verifications can be completed instantly via live chat, or within 24 hours via email. A wide number of banking options is usually one of the benefits of going with a big bookie. William Hill are no different in this regard. There’s a truly enormous range of banking options on offer here. These range from the commonplace – credit card, PayPal, Skrill, and so on – all the way through to cash vouchers. You can see a full list of the available payment choices here. The minimum deposit amount varies depending on the banking method you choose. Credit cards, for example, only require a £5 deposit, whereas e-wallet options – like PayPal – have a £10 minimum. The minimum William Hill withdrawal amount varies depending on the method, in the same way as deposits. The processing time varies too, but withdrawals should be made within 1-5 working days. You’d expect any major bookie to offer high quality customer support, and William Hill do exactly that. There’s a whole range of ways to reach William Hill’s customer service. You can get in touch via email, live chat or phone (which is free if you call from a mobile). The support team is available from 09:30-21:30 Monday to Friday, 08:30-21:30 on Saturday, and 11:00-18:00 on Sunday. In addition, there’s also an excellent FAQ section. It’s well-organised, extremely comprehensive, and the articles are written in a straightforward, helpful way. If you’ve got a query, the chances are you can find the answer immediately here, without any need to contact the brand. The William Hill brand is one of the original “Big Three” bookmakers – along with Coral and Ladbrokes – which first dominated the British betting market. Interestingly, whilst the other two bookies merged back in 2016, the football bookmaker has stayed independent (though its ownership has changed hands many times). It was originally founded in London back in 1934 (gambling was actually illegal at the time). In the intervening eight-plus decades, it has grown into a true titan of the industry. As of 2017, William Hill had over 16,000 employees, a revenue of £1.7 billion, and some 2,300 physical outlets still in operation. Since 2009, William Hill has been based in tax-friendly Gibraltar, but it has still retained a full British gambling license. We pride ourselves on making all of our bookmaker reviews objective and balanced. This review has been almost relentlessly positive… but, quite honestly, that’s because there’s effectively nothing to criticise here. Despite being one of the oldest names in the business, William Hill sports and football betting firm have moved with the times flawlessly, and offer everything you could want from a modern-day bookie. Between the extensive promotions, the outstanding mobile app, and the wide range of markets, they genuinely provide everything you could ask for. Join William Hill, and you’re unlikely to be looking for a new bookie for a very long time. We highly recommend signing up today, taking advantage of their excellent Bet £10, Get £30 welcome offer, and simply enjoying one of the best options on the market.